The NFL playoffs continue Saturday night with the Dallas Cowboys taking on the Los Angeles Rams at 8:15 p.m. on FOX. FOX also has the late Sunday NFL window this weekend, which happens to be the Eagles' re-match against the New Orleans Saints. The games that land in that late Sunday slot usually draw the weekend’s highest ratings (Last week, Eagles-Bears on Sunday drew a higher rating and more viewers than Seahawks-Cowboys on Saturday), meaning networks typically send their top broadcast crew. But this weekend, FOX sent its No. 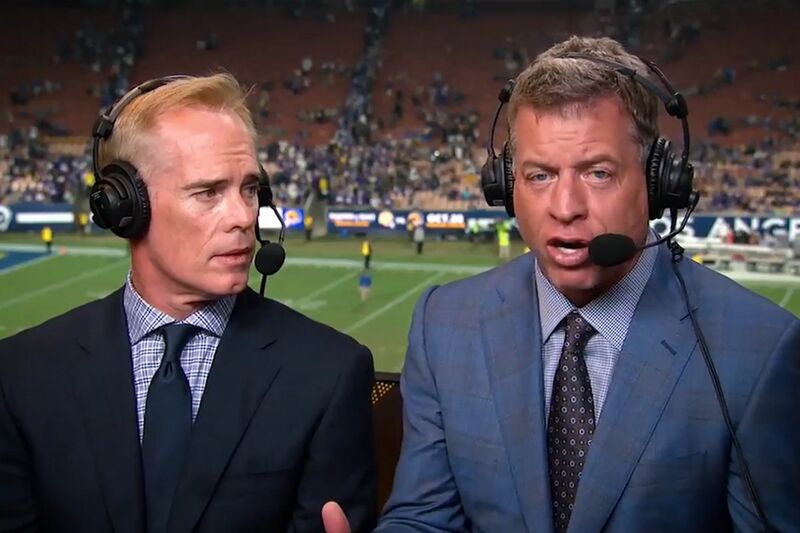 1 broadcast team — Joe Buck and Troy Aikman — out to Los Angeles to cover today’s Cowboys-Rams game. The network’s No. 2 team — Kevin Burkhardt and Charles Davis — will cover Sunday afternoon’s Eagles-Saints match-up. According to Classic TV Sports’ Jeff Haggar, this is the first time in 38 years a network decided to place its top broadcast crew on the lower-rated Saturday afternoon game. The last time it happened was during the 1980 playoffs, when CBS sent its No. 1 team at that time — Pat Summerall and Tom Brookshier — to call the Saturday Vikings-Eagles game. “They kind-of left it up to us,” Buck told Sports Illustrated Media Podcast host Jimmy Traina earlier this week. “It just felt like Cowboys-Rams has a feel to it like, ‘Man, I know it’s Saturday night, but it has the potential of being a spectacle.’ We’ll see. Usually, they don’t live up to that. But at least going in that’s what it feels like." On the NFL Network, coverage begins at 9 a.m. with a three-hour edition of Good Morning Football: Weekend, hosted by Colleen Wolfe and featuring analysts Michael Robinson, Steve Smith Sr., and Mike Garafolo. NFL GameDay Morning starts at noon, hosted by Rich Eisen alongside analysts Steve Mariucci, Kurt Warner, and Michael Irvin. NFL Network insider Ian Rapoport will provide live updates throughout the morning. ESPN will preview the Colts-Chiefs game with a special Postseason NFL Countdown at 3 p.m. hosted by Sam Ponder. She’ll be joined by analysts Matt Hasselbeck, Randy Moss, Rex Ryan, Charles Woodson, and Louis Riddick, with Chris Mortensen and Adam Schefter providing live updates. At 7:30 p.m., FOX will preview the Cowboys-Rams game with a Saturday edition of FOX NFL Sunday, hosted by Terry Bradshaw and Curt Menefee. They’ll be joined by analysts Howie Long, Jimmy Johnson, Michael Strahan, and Tony Gonzalez, with updates from NFL insider Jay Glazer. The wild ride through the playoffs is on again. Don’t miss a minute of it with the area’s clear leader in Eagles coverage. Go to philly.com/gobirds to subscribe.